Sterling silver, Turquoise, Magenta Turquoise, Opal, Red and Orange Oyster Shell (inlay may vary slightly). The link bracelet measures approximately 7-1/4" inside circumference which means the bracelet will fit a wrist that is 6-1/4" to 7" comfortably. Each link measures approximately 5/8" long and 1/4" at widest point. If youre looking for elegance and beauty, you found it! 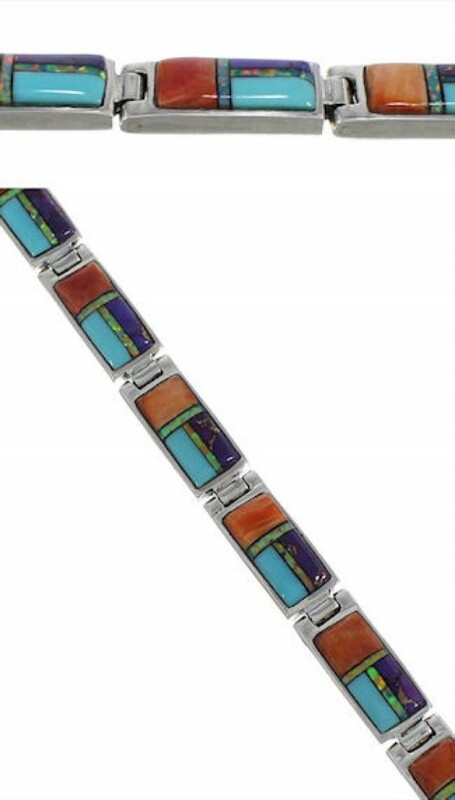 This gorgeous piece of jewelry is hand crafted out of genuine sterling silver and multicolor inlay. The inlay consists of: real Turquoise, Magenta Turquoise, Red and Orange Oyster Shell, along with man made Opal. The inlay is delicately set in ELEVEN links that form a stunning design. The bracelet is complete with a silver box clasp. The bracelet is stamped sterling.